how is it that january is almost over already? which also means that it’s almost time for me to start my life back up in new york again. yup, that’s right! my life in paris will be coming to an end in just a few short weeks. and with another move comes a lot of planning for logistics, packing, and coordination. life in the past few years kind of passed as a series of moves, and these past few months have really proved that i’ve become an expert at picking my life up and setting up shop elsewhere. to make sure that i don’t become overwhelmed, i created a microsoft excel workbook of my entire year broken down by months, weeks, days along with keeping track of flights, errands, meetings, travel, goals, and milestones. you’d think that an obsessive control freak planner like me would feel motivated by compartmentalizing every single detail of life but it had the exact opposite effect. i instead felt burnt out - if you saw my body last week, it probably was slumped over ninety degrees, scraping by on fumes. my closest friends were about to arrive in paris and i was a bit afraid that i’d still be in the same slumped over state and not have energy to enjoy our time together. buuuuttt magic. somehow, just the thought of them coming got me to pick myself up and get things done. i even marie kondo’d the crap out of my toiletries and learned that collected hotel shampoo does not spark joy. 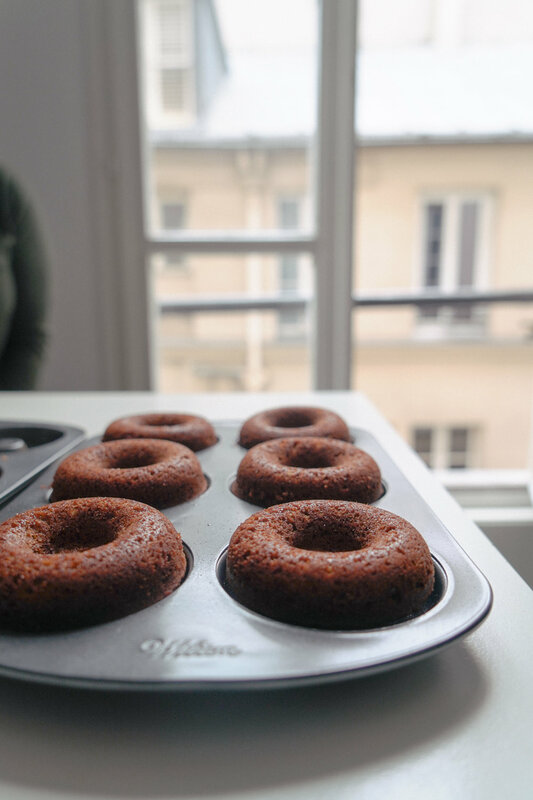 i reorganized all of my luggage, had time for a walk to the boulangerie to pick up pastries in the morning, made coffee and eggs, and even a reattempt at failed donuts that i made last week. maybe it’s magic (or hormones), but i’d like to think that this change came about purely by being in the company of people who you deeply love. and these people remind me to have fun and to not take myself so seriously all the time. and i just learned how important that is. no matter how hard i push myself with aspirations and my career, my goals won’t be enough to keep me going. fuel can come in different forms and for me this time around came from unplugging from work and social media, along with taking the time to enjoy life with friends and let go for once without thinking about how behind i think i am on my big to-do spreadsheet checklist. and if you feel like you’re in a similar burnout funk, call up your closest girlfriends, recall fond memories, laugh at each others dumb jokes, eat bread with butter, drink lots of wine, share an appreciation for great meals, and a deeper appreciation for junk food. it really does help. and…just about an hour ago, at 1:30AM i accidentally deleted everything i said up there so that was round 2. i had one more thing to note before hitting publish, which is actually why you came to this post in the first place! the donuts! 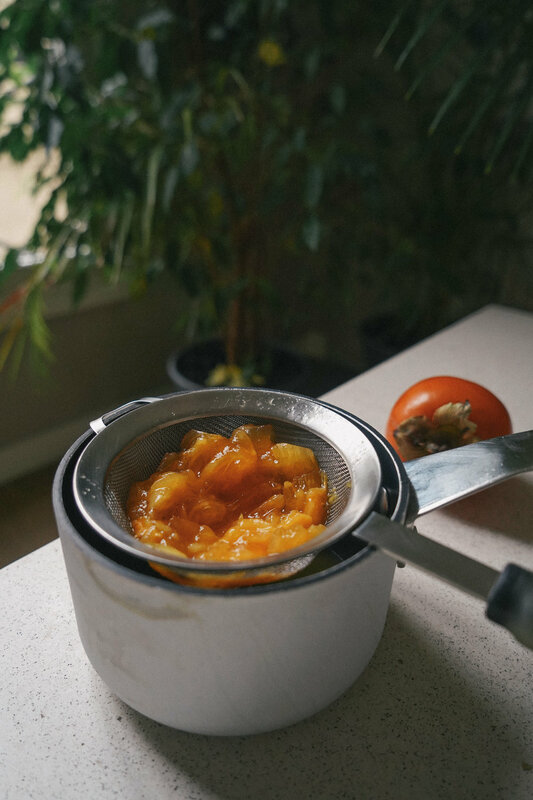 if you have softened persimmons laying around, now is the time to mash them up into a puree and make airy spongey donuts and top them off with a sweet earthy maple glaze. enjoy!! the best cure for burnout: friends who make you laugh until your stomach hurts and you want to pee in your pants. in a medium mixing bowl, combine dry ingredients. 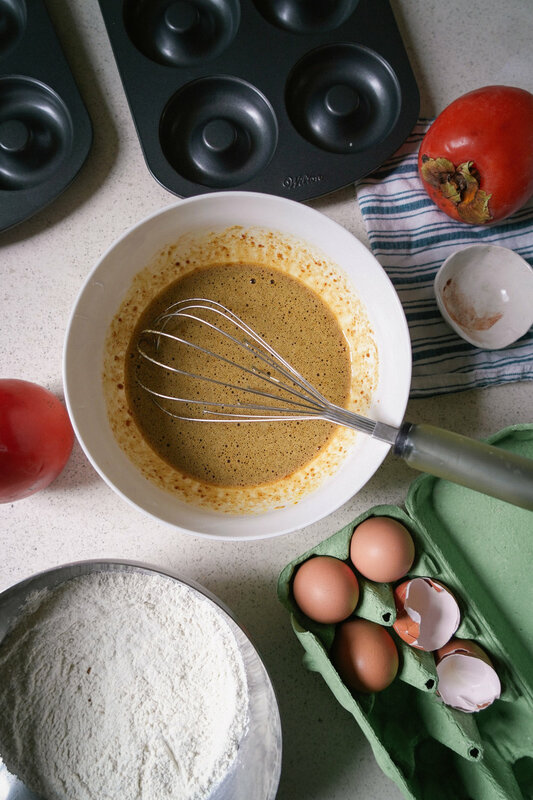 in a separate mixing bowl, whisk together all wet ingredients (minus the persimmon puree). in 1/4 increments, fold in dry ingredients into wet ingredients using a rubber spatula. combine thoroughly until all dry ingredients are incorporated. then finally, fold in persimmon puree. glaze: in a small saucepan, add in 1 1/4 cup confectioners sugar with maple syrup. whisk under low heat until smooth and shiny. if too wet, add in reserve confectioners sugar in small increments. if too thick, add in a little maple syrup. when glaze looks right, test by adding a drop to a dish. if the glaze sets and hardens in a few minutes, your donuts are ready to be dunked!